Viewers find their seats inside The New Temple Missionary Baptist Church for the LA screening of Amazing Grace. "Against the better advice of her recording company, she decided to go back into the church and record a gospel album," Sabrina Owens, Aretha Franklin's niece, says. Owens, who was 14 at the time, wasn't there those two nights. And like many, she didn't know that a young Sydney Pollack, who would later direct Tootsie and Out of Africa, was there. He was filming the entire event, which was hosted by Franklin's longtime mentor, himself a giant figure in gospel music, Reverend James Cleveland, the former minister of music at Aretha's father's church in Detroit. Pollack captured the electric, soulful performance. He also captured the sweat on Franklin's face and audience members dancing in the aisles. He captured the experience of being there. Unfortunately, he failed to capture the film takes with a clapperboard, so it was impossible to synchronize the audio with the images. "When you see it, then it's a different experience," producer Alan Elliott, who grew up obsessed with that album, explains. "Because then you can see that James Cleveland breaks down in the middle of 'Amazing Grace' and starts crying, and has to leave the piano." 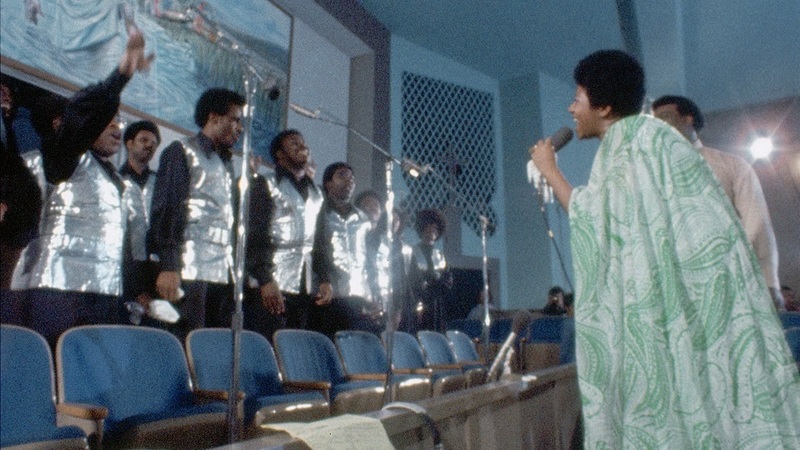 Aretha Franklin and members of the Southern California Community Choir in a still from the documentary Amazing Grace. Before Pollack died of cancer in 2008, he gave Elliott his blessing to try to finish the film. Elliott mortgaged his own house to buy the negative from Warner Brothers without knowing about the synchronization issue. "And so, there was this bipolarity to it," Elliot says. "Which was: 'Oh my God, we have to start from scratch.' And then on the other side: 'Oh my God, we have all the footage.' Then, there was an opportunity, and that was really exciting." But there was another major obstacle: Aretha Franklin. The singer sued Elliott in 2011 to prevent a private screening and she stopped him from premiering the film at the Telluride Film Festival in 2015, and again in 2016. No one really knows why she didn't want the film to come out, though after she died in August, her family was quick to green light the release. "All the technical difficulties are fixed and when I saw it, it was such a moving and powerful experience, I thought that everybody deserved to see it," Owens says. "And since Aretha did not have an issue with the content of the film, only other things, she would have loved this. And I think she would have wanted her fanbase to see it." 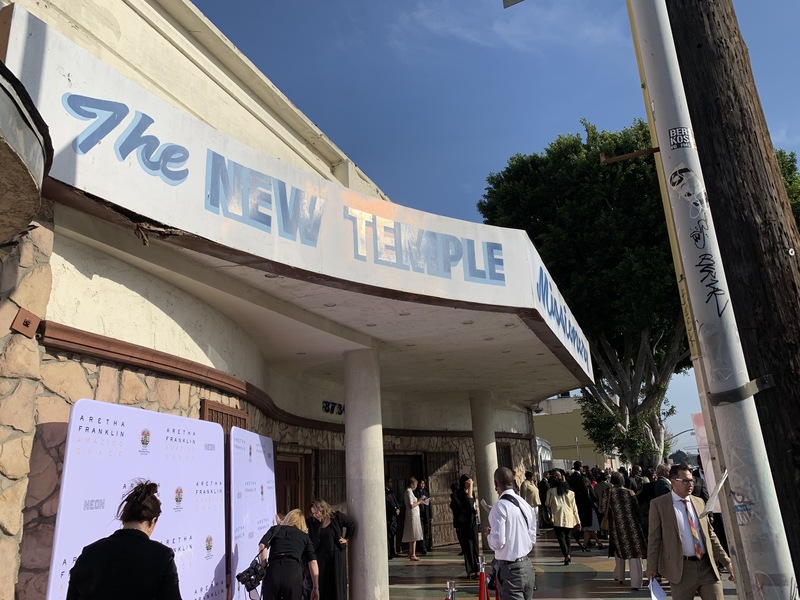 Fans file into The New Temple Missionary Baptist Church in Watts, Los Angeles for the screening of Amazing Grace. 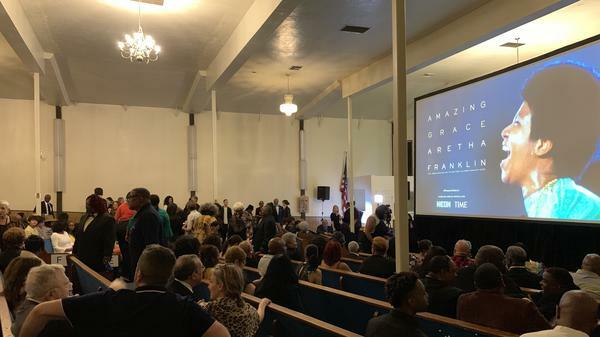 And so, on a cool spring night in Watts, the documentary team hosted a premiere of Amazing Grace right in The New Temple Missionary Baptist Church. The church has been retrofitted a little, but to Elliott, it's still a holy site. Even the big mural of Jesus in a river, which hovers over the choir throughout the concert film, is still there. "The other day somebody asked me, 'What's the historical meaning of this church?'" Elliot recalls. "And I said, 'Well, you know, it's like what Mozart's church or Bach's church is, this is what this church is for gospel music.'" Singer Eddie Kendrix was one of several people at the premiere who was there in 1972. "I've known Aretha since she was like 13 years old," Kendrix says. "She's always been bigger than life, so it was no mystery that all of this is going on. That's the type of talent she was." A number of original choir members, now with grayer hair and oxygen tanks, sat up front. Reverend Dr. Alexander Hamilton, who had directed the choir and arranged many of the songs, led his singers in two spirituals from a wheelchair. As the movie started, the New Temple Missionary Baptist Church once again became an Aretha Franklin concert and a church service all at once. "You can't hardly listen to her without singing along," Kendrix says. Almost a half century ago at a Baptist church in the historically black Watts neighborhood of Los Angeles, Aretha Franklin recorded "Amazing Grace." It became the bestselling live gospel album of all time, and it remains a favorite of gospel fans. Those sessions were filmed by director Sydney Pollack. He died in 2008 with the film unfinished. Now, 47 years later, "Amazing Grace" the movie had its West Coast premiere in that same Baptist church. Tim Greiving was there. TIM GREIVING, BYLINE: It was an odd scene for a movie premiere - people all dressed up like they were going to church. And they were, in a sense. The New Temple Missionary Baptist Church is still a house of worship, although the rows of pews here used to be folding theater seats because the building started out as a movie theater. And for two nights in 1972, the church became a recording studio as the Queen of Soul returned to her roots and sang to the Lord. SABRINA OWENS: Aretha was 29 years old, at the pinnacle of her career. GREIVING: Aretha Franklin's niece, Sabrina Owens. OWENS: And against the better advice of her recording company, she decided to go back into the church and record a gospel album. GREIVING: Owens wasn't there those two nights. She was just 14. And, like many, she didn't know that a young Sydney Pollack, who would later direct "Tootsie" and "Out Of Africa" was there filming the entire event, which was hosted by Franklin's longtime friend, the Reverend James Cleveland. JAMES CLEVELAND: I'd like to say good evening to everybody. We'd like to thank you for coming tonight to the first religious recording session of the Lady of Soul, Ms. Aretha Franklin. GREIVING: Pollack captured the electric, soulful performance. He also captured the sweat on Franklin's face. He captured audience members dancing in the aisles. He captured the experience of being there. Unfortunately, he failed to capture the film takes with a clapperboard, so it was impossible to synchronize the audio with the images. Producer Alan Elliot grew up obsessed with that album. ALAN ELLIOT: But then, when you see it, then it's a different experience because then you can see that James Cleveland breaks down in the middle of "Amazing Grace" and starts crying and has to leave the piano. ELLIOT: Now you see James Cleveland, and you're having that experience inside this church. GREIVING: Before director Sydney Pollack died of cancer in 2008, he gave Alan Elliott his blessing to try to finish the film. Elliott mortgaged his own house to buy the negative from Warner Brothers without knowing about the synchronization issue. ELLIOT: And so there was this bipolarity to it, which is, oh, my god. We have to start from scratch. And then, on the other side, oh, my god. We have all the footage. Then there was an opportunity, and that was really exciting. GREIVING: Fortunately, technological advancements enabled Elliott to sync the sound. He fashioned a 90-minute concert film with no narration, no interviews - just Aretha singing her heart out, backed by the Reverend Cleveland and the Southern California Community Choir. ARETHA FRANKLIN AND THE SOUTHERN CALIFORNIA COMMUNITY CHOIR: (Singing) Oh, what a friend we have, friend we have in Jesus, in Jesus. GREIVING: But there was another major obstacle - Aretha Franklin. The singer sued Alan Elliott in 2011 to prevent a private screening, and she stopped him from premiering it at the Telluride Film Festival in 2015 and again in 2016. No one really knows why she didn't want the film to come out, though after she died in August, her family was quick to greenlight the release. Her niece Sabrina Owens explains. OWENS: All the technical difficulties are fixed. And when I saw it, it was such a moving and powerful experience, I thought that everybody deserved to see it. And since Aretha did not have an issue with the content of the film - only other things - she would have loved this. And I think she would've wanted her fanbase to see it. GREIVING: And so on a cool spring night in Watts, we were back in the church where it happened. It's been retrofitted a little, but to Alan Elliott, it's still a holy site. ELLIOT: Kenny Looper (ph), the organist, played the organ right here, which is the original organ. And we are looking at the pulpit where Aretha sang - right there. GREIVING: Even the big mural of Jesus in a river, which hovers over the choir throughout the concert film, is still here. ELLIOT: The other day, somebody asked me - they said, what's the historical meaning of this church? And I said, well, you know, it's like what Mozart's church or Bach's church is. This is what this church is for gospel music. EDDIE KENDRIX: Surreal. It's just a lot of memories, a lot of memories. I've known Aretha since she was, like, 13 years old. She's always been bigger than life, so it was no mystery that all of this is going on. That's the type of talent she was. GREIVING: Kendrix was one of several at the premiere who were there in 1972. A number of original choir members, now with grayer hair and oxygen tanks, sat up front. And Alexander Hamilton, who had directed the choir and arranged many of the songs, let his singers in two spirituals from a wheelchair. KENDRIX: You can't hardly listen to her without singing along. GREIVING: For NPR News, I'm Tim Greiving. Transcript provided by NPR, Copyright NPR.